Lets have a cocktail...: I knew FOX was one of my favorite words for a reason. I knew FOX was one of my favorite words for a reason. Fox. I love the word. He is a fox. She is a fox. That is foxy. Vixen (female fox.) Out-foxed. Sly fox. Ergo, it makes perfect sense that word would be attached to one of the best experiences of my life which is also the exciting news I mentioned yesterday and the unexpected birthday gift I received this weekend. A furry new pet fox? No. A sassy compliment? No. Outsmarting a shylock? No, not that kind of fox either. But rather my first national television appearance as a blogger. I was called by a Producer for Fox News in New York last Thursday and hope I didn’t disengage the chandelier doing my high kicks. 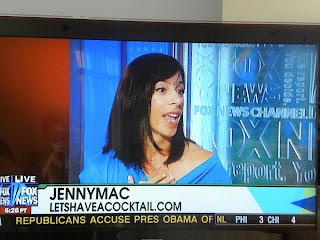 I was invited to be a guest on the Fox and Friends morning show to respond as a blogger and mother to a controversy that has parents at odds with a component of the fashion industry. Fox and Friends Anchor, Alisyn Camerota, was hosting the segment and since I was actually flying to New York for a long weekend, I would do the segment live in the studio rather than at the local Fox affiliate in Atlanta. I have been on television a handful of times but this was by far the most amazing (and surreal) experience. I received great guidance from one of the Producers, and I certainly did my research. I am unable to post the video here due to proprietary rights but here is a pic of the set I was on with Alisyn and one more screen shot. Yes, the screen shot shows my debate face. And apparently I like to talk with my hands more than an Italian grandmother. I am so grateful to Fox News in NY, the Producers, especially LW, and Alisyn for the experience. Two minutes prior to the segment, the woman who would be debating from the opposite stance of me could not present. Alisyn informed me she would then be playing devil’s advocate as opposed to moderating. Off camera, I told Alisyn “Ohhhh, I don’t like the devil.” To which she cracked up. I also asked her to take it easy on me considering she is a long-term TV personality and professional while I am best known for Flip videos made in our house. She was forthright with her questions, deliberate and direct but still the consummate host. And my goal was to avoid sounding like Ron Burgundy. To summarize the experience: IN-CRED-I-BLE. The segment was three minutes long which can feel both eternal and yet microscopic when you are on live television. I was so honored to be asked and it is further demonstration life is full of surprises. *When something like this happens, you are as giddy as you were when you got a puppy for Christmas when you turned six. It is made infinitely more fantastic when your best friend in the world is with you. Times ten when your entire family rallies like you were just appointed to the Supreme Court. *No matter how old you are, you can still get nervous. *Having a great group of friends is one of the best gifts in life. Friends of mine I have not seen in a decade (or longer) sent or posted awesome and supportive notes and emails. Why does that matter as much in these situations? Because, like I said, no matter how old you are, you can still get nervous. *Having your best friend tell you three minutes before you go on air “Remember, do NOT say the F word” even as a joke is NOT funny. LOL. Thanks Marcia Garcia. I will certainly plot revenge. *Your 15 minutes of fame can actually be significantly reduced. Case in point: My husband and son watched the segment live in Atlanta. They phoned me shortly after its conclusion and my son said, “Mommy, I saw you on TV! You looked so pretty. But, WHO WAS THAT GIRL WITH YOU?” Really? Even on my national blogger TV debut, my son is innately more interested in the blonde girl. *We should never forget to make room in our lives for the Giddy. It is not reserved merely for 6 year olds, or those who win a Super Bowl ring. Letting ourselves be giddy about all the wins in between can elevate us, don't ignore it. Do you see what I do for you??? Congratulations! No wonder you were doing high kicks when you heard about this and you have every right to be giddy with joy over this and so very proud too. We all need to release our inner 6 year old selves once in a while, for they are still there, waiting for the right moment to make an appearance. As for friends, well you know you have a good and true friend when they will come, through hell and high water, to support you in the very best and worst moments in life. I wish I could hear the whole piece! If you get a link to it, let us know. I wanna hear your take on things! Congratulations, JennyMac! And let me just say, "You look mahvelous!" HOloy cow how awesome is that.. is there somewhere we can watch it?? Awesome! How exciting for you. Definitely let us know if you get a link to it, I would love to see it! This rocks... great experience for you! Glad you got a special birthday suprise! Holy crap! Television? Way to go! Sounds like an interesting topic for debate, too. Couldn't find it on the Fox News site, maybe later. Ok, you freakin rockstar...that's just so awesome. And I laughed out loud because I would have reminded you to remember to not use the F word too. It's good advice! From one hand talker to another...SO excited for you! And giddy is fantastic! I am giddy for you. I'm giddy FOR YOU!!!! awesome and soooo exciting. I love knowing "famous" people..but knowing you is even better. I agree on the devil thing. It only seems like fun until you realize the whole eternal hellfire part. Now you intimidate me even more than you did. You even have perfect posture. Congrats, that's awesome. Hate that we missed it! No freeking way! That is so exciting! Congrats! Congrats! You need to post the video clip! Hell I just want to be on TV to have my hair done and a smokey eye look I cannot accomplish myself! You are so awesome! And yes, there's something about those Fox girls that turns the heads of my son and husband too. I can't exactly get pay-backs by ewwing and ahhing over Sean Hannity or Shepard Smith. Congrats!! I bet it was exciting. This is as close as I have been to knowing(well kinda) someone famous. What a wonderful opportunity for you! And yes, given my fondness for the F word, that would have been good advice for me...but definitely distracting! Off to try to find the clip! Congrats Jenny! I am so happy for you and I wish so much that I had gotten to see it! Congrats on your tv appearance. Definitely embrace the giddy. Exciting! You are the perfect blogging rep! You will have to tell us just what was said! Is blogging the newest craze sweeping the world? Can't wait to hear more! You go girl! Congrats to Jenny Mac! Amazing! I just found it!!! You REALLY did your homework! AWESOME job!!!! Very cool! I gotta go find the video. I'm sure you were awesome! So awesome I have to find it. Congratulations to you. Love that your friend told you not to use the F-word! I'd have been terrified, but you look beautiful and I can't wait to see the thing in its entirety! Congrats! Wowza! Congratulations! You look absolutely fabulous in the shots above, made for TV! I wish I knew to DVR the segment! That is awesome. Could you post a link? You look great! And managed to not say the eff word, I take it? Tiny Mac doesn't understand that brunettes are so much better than blondes. Way cool! I'm sorry I missed that! That's so cool. You look great! Yay JennyMac! How exciting! I'm heading over to FoxNews to search for it RIGHT NOW!!! Whoo Hoo you go girl! I wish I had known and would have watched but I will try to find it somewhere! Congrats!!!! That is absolutely awesome! Congratulations!! The part about your son cracked me up. I'm going to try and find it somewhere so I can watch it. Again, congrats! Congrats on your Foxy 15-minutes! Well just LOOK at you!!! You look great, missy! Wish I would've seen it!! Dang it. And I'm totally cracking up about "do NOT say the F word" - hahaha!! Well now I want to watch it, can we hulu this or something? Thanks for not telling us, you foxy vixen!!! Is there a clip somewhere we can watch? And judge? Congrats! You ARE a supah-stah! Now I'm off to chekc out Fox (my fav news source) to find you! 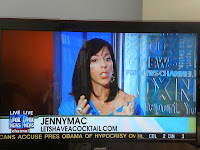 Hey JennyMac, I recently was given an "award" -with strings attached- by a blogger buddy. We had to choose a few others to "Award" and you are one of the few I chose. I linked to you on my latest post, but if you don't want to participate, I will not be offended! I hope you have a great week! Well, that's just extremely exciting. Hey, that's awesome! Wish I'd known ahead of time so I could have watched. I'll bet my parents saw you cuz they can't turn off FOX. Ever. Anyway, congrats. Your pics look fabulous! That's so awesome! Congrats on your appearance! You looked gorgeous, of course! The clip was great. You were expert! The turquoise was a perfect color for you. That is absolutely awesome!! I am so happy for you!! Haha, awesome. I hope you told them to get their news right from now on and to lay back on the fake tan on their anchors. And as I didn't see you live I hope you represented and that it went a bit like THIS. :) You're welcome! That is so completely AWESOME! WHAT?? I finally had a reason to watch Fox besides American Idol recaps and you didn't tell me? (Because this is about me. Sorry.) I mean: CONGRATULATIONS! Good for you, and extra sprinkles because you got giddy instead of worrying yourself to death. Enjoying the moment and being giddy -- that sounds superb. Did you get to sign any autographs? That is awesome! Going to have to listen to that! How flippin' cool. Any chance it will be on YouTube? Well isn't that just the bees knees?! You really should've told us beforehand so we could, like, um, WATCH!!!! Otherwise, I don't watch news on TV. Makes me really annoyed, or angry, or depressed, depending on the moment. In any case, no good comes of it. If I really need to know something, my friend the Internet tells me. :) Anyway, I'll try to hunt it down so I can see it. I'm sure you did an excellent job, just based on your snazzy blog. :) Congrats!!! Oh, WOW! Congratulations! That is awesome, I'm so happy for you and you look great in those screen shots. Now I want to see the segment! Loved being there with you. And that is a fabulous color on you! How awesome are you! What an Amazing experience & truly it couldn't have gone to a better recipient. You are the ultimate blogger in my opinion! You have wit & sass & humor. I adore you & am so glad I found your site. Congratulations to you, I only wish I had seen it! So exciting! I wish I had seen it! Yay! Congrats on being famous!! congratulations! wow! what an experience! wow, that is totally amazing! Now I can tell people, "Oh, I was following her blog way back before she became famous!" 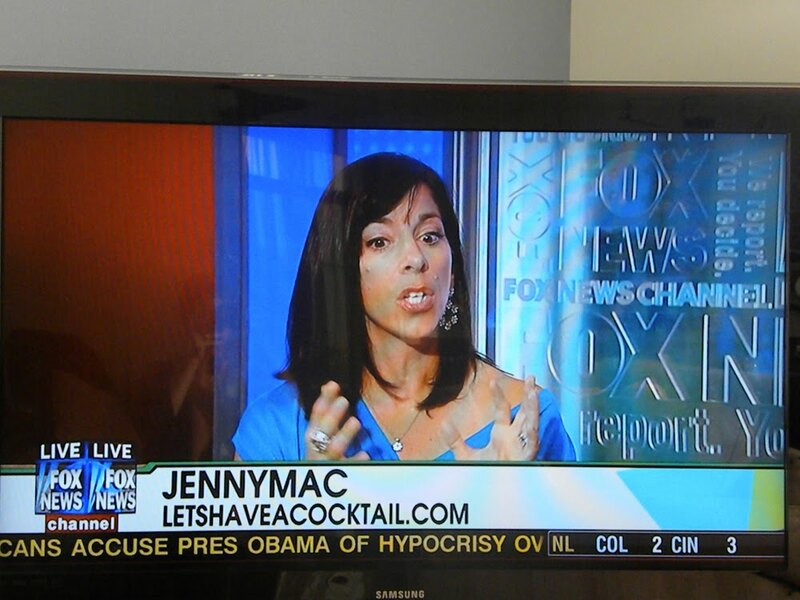 I totally need to get on Fox and see if I can find a clip now. That's so amazing!! Nice work. OK, this is cool beyond all reason. And I get you on the 'abbreviated 15 minutes of fame' thing. I sang backup for Foreigner ONE TIME when they came in concert to Salt Lake. We rehearsed and rehearsed, and then it was time to go on stage. Suddenly, as a singer, I was at Ground Zero, the Holy of Holies, that place where every performer dreams of being. And then, it was like I blinked twice, and we were leaving the stage. Talk about begging the universe for a do-over!! Congratulations! Marcia Garcia is awesome and you're a pro! If I'd been told not to drop the F-bomb 3 minutes before airtime, I'd have been laughing too hard to even go on! This is amazing. Beyond. You are now officially...MY IDOL. Congrats! Congratulations! You are a star, but we already knew that. Giddiness? For me it would have been nausea and thoughts of hari kari. WOOHOO! I just saw the video! Great job! I agreed with alot of the points you made. I will definitely take that into conversations I will be having with my daughter in the future. My husband keeps his TV on Fox News, so maybe he saw it. But I didn't so I'm going to look it up. Wow. Wow. Wow. This is SO cool. Congrats. Well neato-keen! Congratulations, lady! Can't think of a wittier or more well-informed personage to grace the screen than yourself. Way to represent the blogsphere. I'm off to dig up that video right now. I liked Fox News already but now I think they've got the Midas touch (except you were already gold when they tapped you). You sly little devil, you. Here you are a big TV star and we never knew. Now I can say that I'm rubbing elbows with someone famous. And now I know what you look like too. You'll have to let us all know a link where we can watch the video. that's great. congrats! i'm going to have to try to find the clip now. Fantastic stuff. And yet another reason why my wife should cave to my demands for satellite television! For you...I would watch Fox News. But just that once. Congratulations! It must have been a blast. AHHHHHHHH JENNY!!!! This is amazing! Congratulations--what an amazing experience! Congratulations! Glad that you had a wonderful experience. This is awesome! But you are being a bit cruel by teasing us. I cannot find the vid online. How is it possible?! SO very AWESOME! Congrats on the appearance! Your son is my kind of kid! Indeed, Fox is famous and awesome for their use of bombshell reporters. Congratulations on your appearance, too (in both contexts of the word). You didn't get hit on by Bill O'Reilly, did you? Well, of course you're going to be the only woman in his eyes. I'd love to see the clip, too. What was the issue you were called upon to debate? FREAKING-A girl. You got to be on tv. On FOX. That is totally cool and very GIDDY. You look great. I would be dieing!!! I have never ever been on tv. Probably my only claim to fame has been written on bathroom stalls. Your the best JM. Let us know when the segment is on YouTube--I did not see it live. Will this affect your material since more people you know will find out about your blogging? OMG! I can't believe I am only just catching up on this now...HOW EXCITING!!!!!! I have doubt that you were amazing...love that you were nervous....and love that your family and friends were so excited - you are clearly so talented that your Mom must just be the proudest mother in the world. Ever. And LOVE MiniMac's comment about the pretty girl with you!! that is, of course, simply fantastic! good for you! You can't BUY that kind of publicity! AWESOME!!! Somehow I missed this little dandy of a post. My bad! Congrats on your super the coolest experience of going to New York, Uh, I mean OF BEING ON TV!! So cool! Congratulations! That is ridiculously cool:) Must try and find it somewhere!! That is so amazing! Now I need to go and see if I can find the segment so I can watch you in all of your awesomeness! On my gosh!!!!! You look absolutely gorgeous and that was quite an opportunity...can we see the video on the fox site? Well look at you! That is way cool. Congrats to you. That is so freaking exciting...and I must say...you looked GORGEOUS! Great news!!! I love Fox News, you are a PERFECT match for them!! Oh man! My hubby's favorite network! I wish we could have had the heads up to watch. That is really cool! FABULOUS! So happy for you!!! I'm so behind on reading, I just now saw this. Congratulations though, this is so awesome! Are you kidding me!? Good grief! I'm gone for a couple of weeks and look what happens! I can't believe we missed it over here! I wish I had known! This? IS SO AWESOME! WOO-HOO!